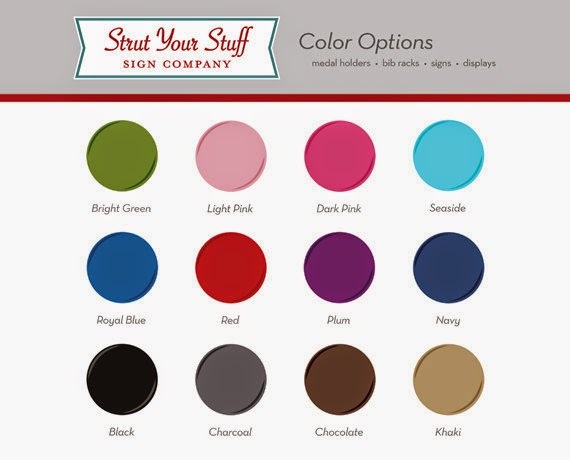 I am very excited to be doing my first "official" product review and giveaway for Strut Your Stuff Sign Company! 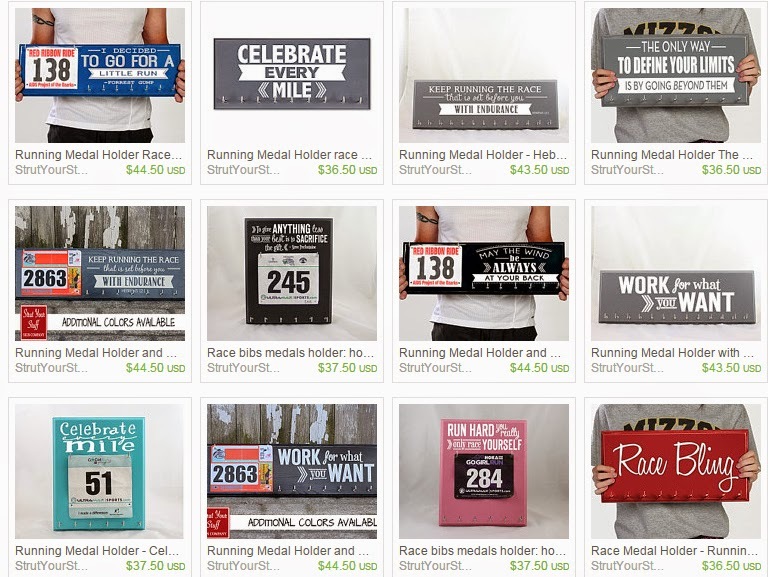 About a year ago I saw a very unique running bib and medal holder on Pinterest, which I forwarded to my husband as a Christmas present idea! Low and behold, I got it for Christmas and loved it!!! It became the center piece of my "running wall" that I put together this past summer at our new house. Then, I found out Shelly, who I was already following on Instagram, was part of Strut Your Stuff Sign Company - the same company my medal holder came from (small world right??). After connecting with her, they offered to let me do a review and giveaway! Since I now have 2 of them - the combined medal & bib holder AND just the medal holder, I'm going to review both of them for you guys! And I will be giving one away as well! So obviously the two products I now have from Strut Your Stuff are pretty similar - one just has the ability to hang bibs as well as medals, and the other is just for medals. They also have just a bib holder as well, and many other designs and colors which you can view and purchase here: www.strutyourstuffsignco.com. My combo bib & medal holder I got for Christmas last year! When I got my original sign, my husband put it together for me, so for the second one I did it myself so I can give you a true, honest review. Obviously, as far as the design is concerned, I love them! They have a lot of different options from bible verses (what I chose) to various running quotes (ex. Forrest Gump) to specific race themes (ex. Boston & Disney). There are so many cute ones offered, it was honestly hard to choose! Since I already had the Hebrews 12:1 / "Run with Endurance" bib/medal combo, I decided to go with just a medal holder this time (which was much needed, as mine is getting way too full from all of the races I've been doing this year), and I decided to stick with the verse theme and go with Philippians 4:13 - "I can do all things through Christ who gives me strength". I've really felt like running has helped me in my relationship with God, so I like that I can incorporate that into my running wall! Some of various styles available (MANY more on their website!!). Strut your Stuff also offers a good selection of paint colors as well. I went with seaside for my original sign, and then a neutral Charcoal for my second sign. 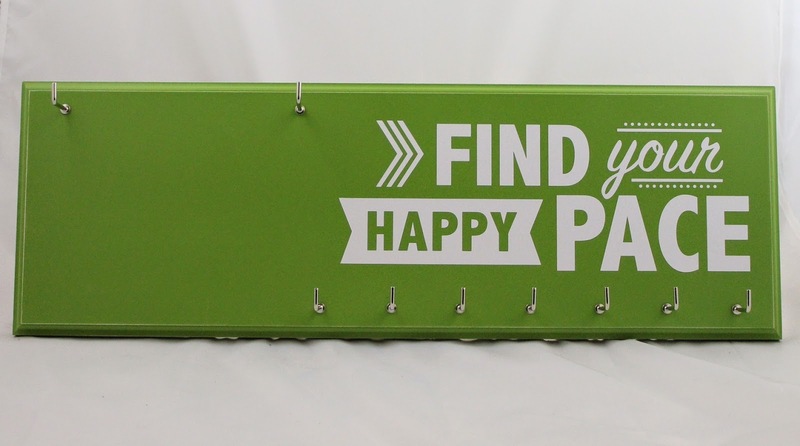 Then I picked the bright green for the giveaway (which I love - but I didn't feel like went with the rest of my running wall)! The sign arrived very well packaged with a lot of bubble wrap to prevent any damage. The brackets that are used to actually hang the bibs and medals from do come separately (in a zip lock bag) and you have to screw them in yourself - but there are pre-drilled holds in place already. I started putting them in by hand which worked until they were about half-way in and it got a little more difficult to keep twisting them, so I ended up using pliers combined with a paper towel (the paper towel was so the pliers didn't scratch the brackets) to get them all the way screwed into the sign. Not the easiest ever, but I'm not sure there would be any better way, as they would probably risk a lot of damage trying to ship them already installed. Plus, overall it only took me about 15 minutes to screw them all in (and that includes time to go find pliers). The sign arrived with lots of packaging and no damage! Next it was time to hang the sign - no biggie here - it comes ready with two holes on each side for nails. My only issue came from hitting a stud in my wall and I kept bending the nails (obviously unrelated to the sign, and instead related to how weak my arms are...(runner problems). Once I finally got the nails in, aligned, and level, hanging it was easy-peasy. And of course so was hanging all of my medals onto it! Voila! New medal hanger all set up on my running wall! Now as far as the combined bib-medal holder goes, everything is pretty much the same, except for that it also includes two extra brackets to hang race bibs from. My only comment on this, is that almost every bib I get has holes at different widths. To accommodate for this the sign came with these little round things that you can thread through your bib. However, as I got more and more bibs throughout the year, I found it a lot easier to just keep the top two safety pins on the bib and hang them by those - it made it much easier and I have never had a problem hanging bibs from it again! So, overall, I really love these signs! 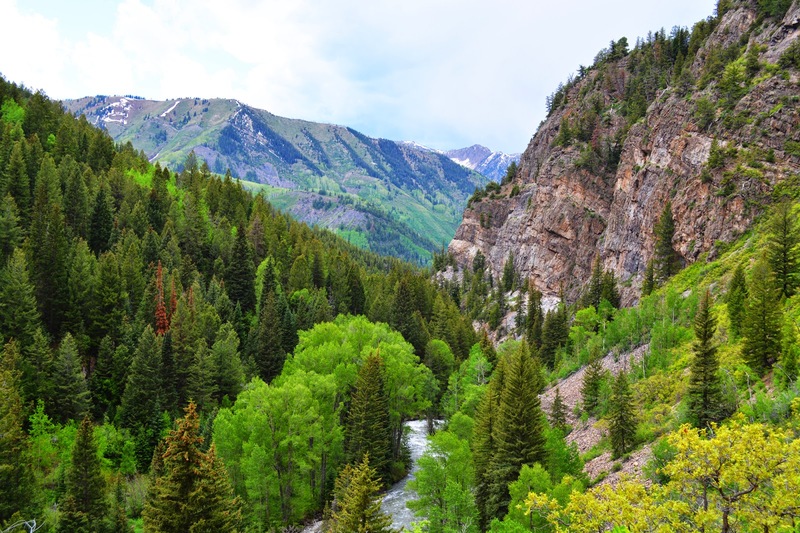 They are handmade here in the United States and are of great quality! I love the variety in quotes, sayings, themes etc, as well the ability to hang bibs, medals, or both, and the color selection is great. They have a nice finished look to them as well. I definitely plan to keep adding to my collection with more Strut Your Stuff products as my race bling continues to multiply! I thought this quote was really cute! To be entered to win, please complete the rafflecopter information below before October 29th. After that time a winner will be randomly selected and notified via email. Lisa Tardi, ldtardi@gmail.com. its currently in a box/binder so it's not on display and I was to display it so bad!!! These are super cool! Love your trophy wall!! I have been trying to win a sign from SYSSCO on Instagram for weeks! I love them so much and I love your wall! I love your running wall!! I need one of these signs, my medals are all sitting sadly in a drawer all crumpled. I would love to win one of these. All of my medals are in a drawer right now. I would give it to my dad. So cute!! 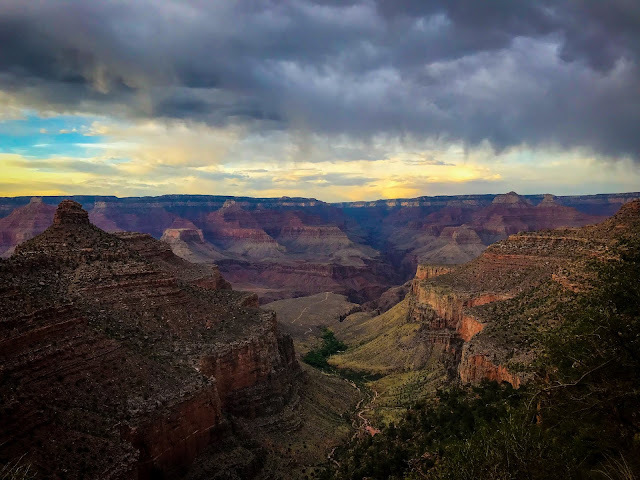 I am new to running, but already addicted! Haha! I have done six 5ks, two 10ks, three half marathons, and one (soon to be two) full marathon. Right now I am using thumb tacks to hang my bibs and medals on my wall and it works, but I would love to be able to display then in a cute way :) And I love your PR board!! Really need something like this, have so many medals and they are all in ziploc bags. 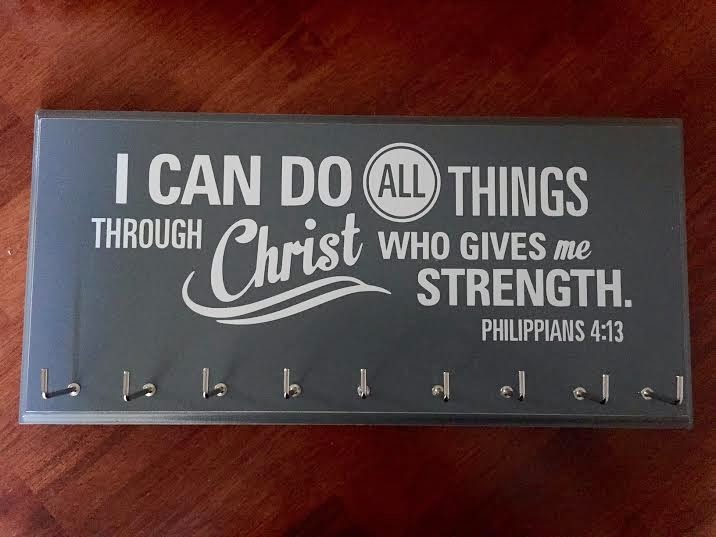 Love the Philippians 4:13 option, that's my favorite Bible verse. I've seen these all over Etsy and have always wanted one... Especially with my medals feeling rejected and left out hanging out on top of my dresser. Sad to see your RnR marathon race didn't go so well, but at least you've got another medal to add to your own display. I currently have mine hanging on my wall with thumbtacks.